on vertical pair "TWEE PENCE/Z.A.R." on 6d black-brown (SG.191). 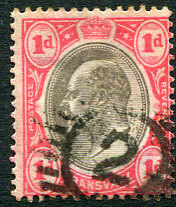 (T.6) coded barred triangular on Natal QV 1d (SG.99a), very minor toning. 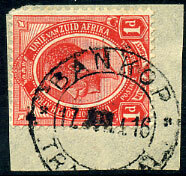 (11 bar) "2" on Transvaal 1902 KE7 1d (SG.245). 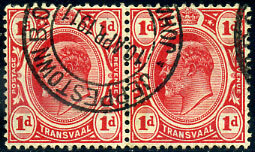 (11 bar) "2" on Transvaal 1902 KE7 ½d (SG.244). 18 APR 07 on KE7 6d (SG.266). A/MR 7 95 on 6d (SG.210). A/FE 19 95 on 2d (SG.207). 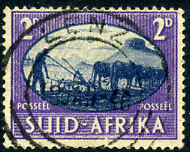 10 APR 1911 on horiz. pair KE7 1d (SG.274). 19 NOV 08 on horiz. pair KE7 1d (SG.274). 5 AUG 12 on KE7 1d (SG.274). 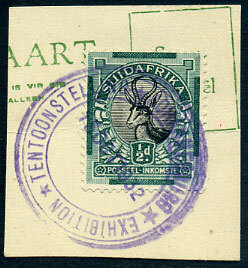 19 APR 19 on SA KGV 1d piece. 5 SEP 10 on KE7 1d (SG.274). 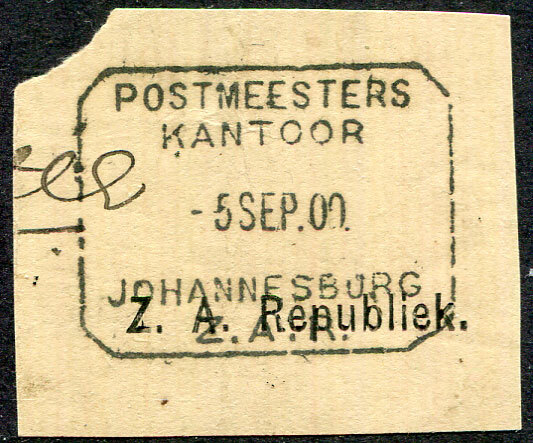 4 OCT 1913 on KE7 1d (SG.274). 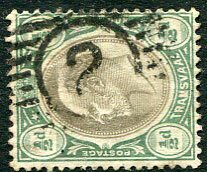 25 JAN 1912 on KE7 1d (SG.274), slightly soiled appearance. 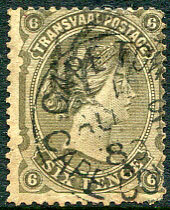 6 JAN 03 on KE7 6d (SG.250), minor corner crease. 9 APR 10 on KE7 1/- (SG.267). 17 JUN 16 on SA KGV 1d piece. 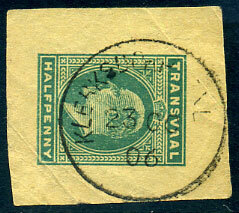 Railway Office dated 14 MAR 1906 on KE7 6d (SG.266), larger tear at base. skeleton dated 23 OC 06 on KE7 ½d newswrapper cut-out piece, some creasing. 18 MAY 10 on KE7 1/- (SG.267). 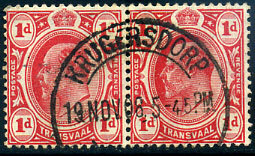 9 DEC 1912 on KE7 1d (SG.274). 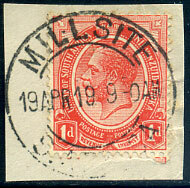 2 APR 10 on KE7 1/- (SG.267). 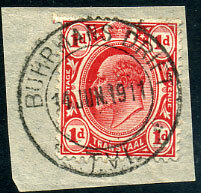 14 JUN 1911 on KE7 1d (SG.274) piece. 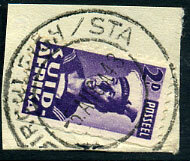 28 SEP 42 on South Africa 1½d piece. 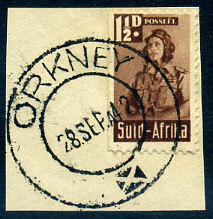 24 AUG 07 on KE7 ½d (SG.273). 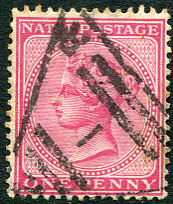 (D/R) 14 AUG 09 on KE7 2d (SG.262), tear at top. 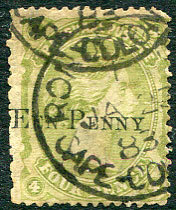 A/FE 14 without year on 1/- (SG.183).